When you arrive for check in you will be greeted by our friendly English and Spanish speaking staff. They will check you in prior to boarding, direct you to the restrooms (although remember there are two onboard) and answer any last minute questions you may have. It is always better to arrive around 15 minutes before your departure time. We have seating in both the shade and the sun where you can enjoy the exclusive resort of Puerto Aventuras prior to setting sail. Your bilingual guide will collect you from the shop and take you to the boat. Our crew are all extremely competent, experienced and just generally great guys! We are proud of the fact that most of them have worked for Fat Cat for 10 years or more. The crew will ensure that everyone gets on board safely and is seated for the safety briefing. Your safety is our first priority so we ask for your undivided attention to this briefing before the fun begins. You will be setting sail from Marina Puerto Aventuras. This is a small community with the marina and golf course and some spectacular homes and condos. As you head out onto the Caribbean ocean you will be stunned at the clarity of the turquoise water and the undisturbed powder white beaches which you will cruise past. Sun lovers can head out to the nets and soak up some Mexican sun. For those who prefer a little more shade there are ample spots to sit and catch up with family and friends. Our crew will be on hand to answer any questions you may have but more importantly they will be there to serve you platters of delicious, fresh, tropical fruit. The bar will be opened and our bar tender will be there to keep your glass topped up. Included in our complimentary bar you can enjoy a selection of Corona beers, our famous rum punch or a margarita. We also serve rum, vodka, a selection of mixers and plenty of purified water. Speciality drinks can be added to your charter package. Whilst sailing to your first destination at Bahia Ihna your crew will be happy to put the fishing lines out. If you catch anything they will be happy to put it on ice if you wish to take it back to your villa or hotel to be cooked. As you arrive at Ihna your catamaran will slip onto the inside of the reef where you will anchor in the shallow protected waters. 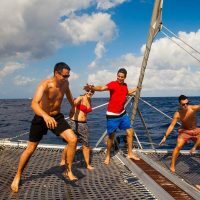 This makes getting on and off the catamaran easy and safe and also means that anyone choosing to stay on board and not snorkel can enjoy being anchored in calm waters. Bahia Ihna has a vibrant reef teeming with a variety of tropical fish. Your guide will take you on a tropical snorkeling safari! Where you can expect to encounter sea turtles, rays and many varieties of tropical fish including damselfish, drum fish, angel fish, parrot fish and many more. 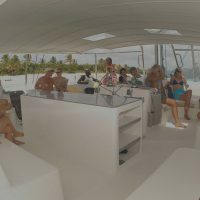 As your group returns to the boat the crew will help everyone off with their snorkel equipment and offer you a refreshing cocktail, beer or soda to quench your thirst. They will also serve you some delicious simple snacks of home made salsa and guacamole with chips or a tasty individual picnic. If you have chosen any additional food they will serve it at this time also. With everyone relaxed and enjoying some snacks and drinks your crew will raise the anchor and head out from your protected spot behind the reef towards your second stop. Again if you like they will be happy to get the fishing lines out and help anyone who is interested hook a fish or two. As you sail across the stunning bay of Puerto Aventuras passing the beautiful condos and beach houses you will head to our second sheltered swim stop. In this area the cool waters from the cenotes under the ocean floor jet through the sand. We like to think of this as a Mayan jacuzzi! You will be encouraged to wear your life jacket like a diaper at this point and bob in these waters whilst enjoying a beer or cocktail. 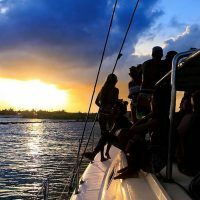 This is also the best opportunity to jump off the side of your private catamaran into the turquoise Caribbean and hope that someone is on hand to catch the moment on camera! As you head back to the marina your crew will give you the opportunity to share a small tequila to toast your memorable day. The crew will be there to assist you in getting off the boat and heading to your transport or villa where we are sure the chat at the dinner table will be all about your exclusive private charter on Fat Cat!